I can't believe I'm about to finish the Harry Potter series, it was my first time reading it and I'm so sad this series is almost over. 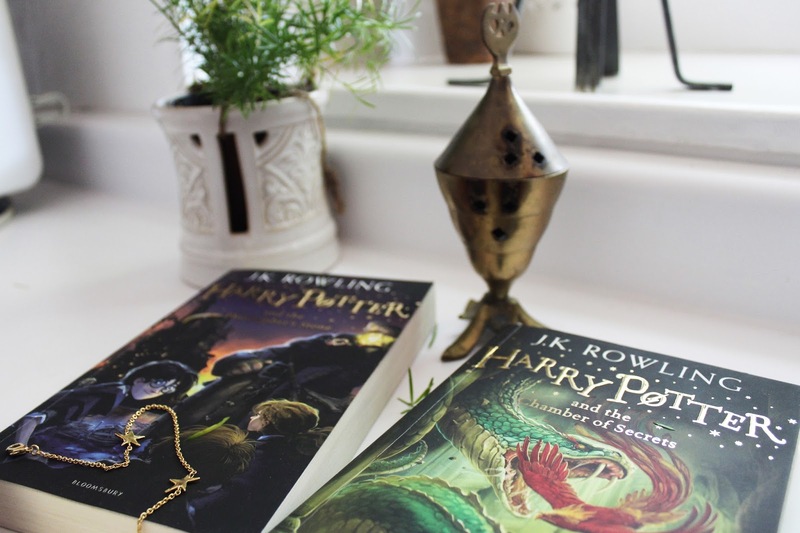 Even while reading as a 19 year old, these books were still incredibly magical for me and I honestly couldn't wait to read the next chapter or start the next book to find out what the wizarding world was up to. 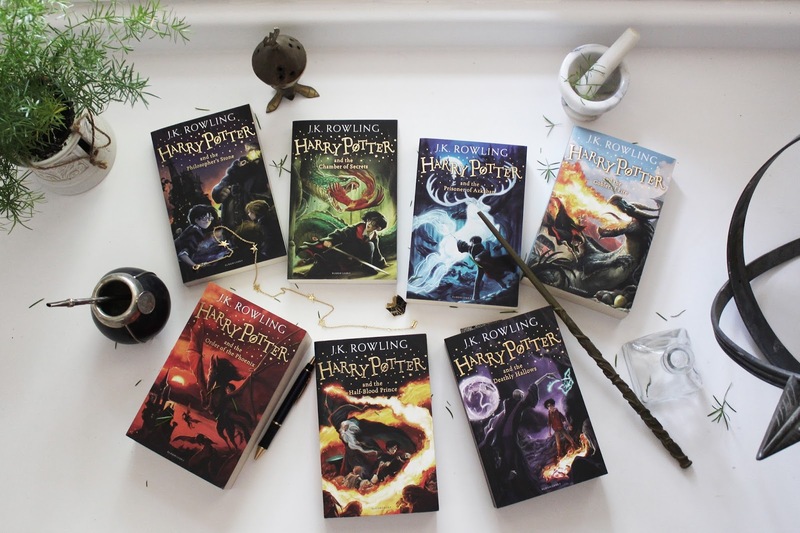 The Harry Potter movies have been a huge part of growing up and life in general (Sterling and I even binge-watched the movies within our first month of dating) but I never took the chance to actually read the series even though I have always been a book lover. I don't regret leaving it until now though because I was able to really appreciate the little details that form the exciting world J.K Rowling created. 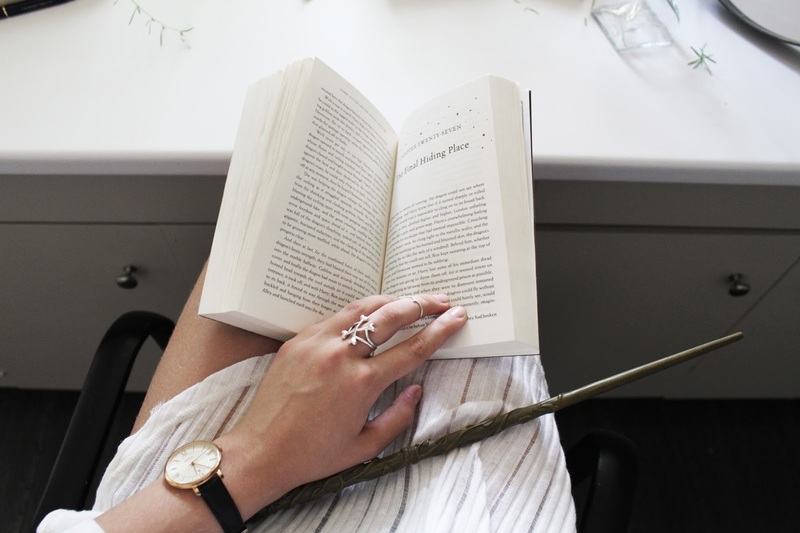 Reading each book was a wonderful and unique experience that always seemed to take me right across the Black Lake and into the great hall of Hogwarts along with the other students. Rowling's writing heightened my imagination and even when I wasn't reading the novels, I was thinking about what my Patronus would look like and studying up on Pottermore. 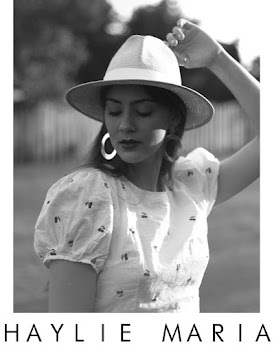 While reading, I noticed that in the first three books (and when Harry is young) Joanne's writing comes across as a lot more naive and innocent, then as the characters mature, her style comes alive. Her writing was never bad in my opinion but by the end of the third book I feel like all her talents were laid out onto the pages for the rest of the series. I did find that there were some scenarios explained in kind of cheesy ways but even then I secretly really enjoyed everything I read. The Order of the Phoenix was a long book to devour and sometimes while reading I worried that I was getting annoyed with it but in the end, Umbridge and her torturous rituals were the real cause of any aggravation I felt. There were some incredibly powerful moments that I felt held so much more emotion when reading than watching the movies; like when Serius first offered Harry to stay with him over the summer, when Harry faced Voldemort in the graveyard and their wands created the connection, and obviously when poor Harry was forced to witness Cedric, Serius, Dumbledore and Dobby's deaths. I know that after I finish the last half of the Deathly Hallows Harry Potter and the world he lives in will most definitely be on my mind, I'll probably want to reread them even. I feel like my connection to the Harry potter series is a little biased though because of how much I enjoyed the movies as a kid. 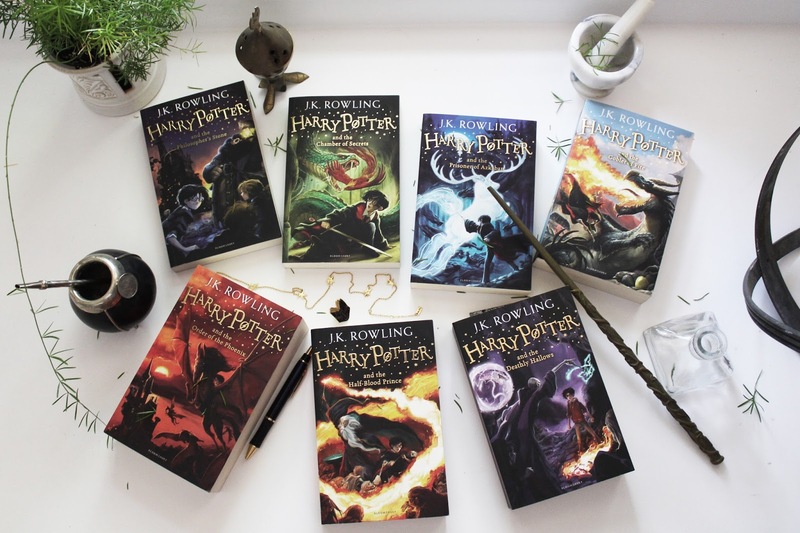 From working in a bookstore, I have realized that not everyone likes Harry Potter (which does surprise me though I do understand it) but for me this series was really special to read and it honestly has made my fandom grow immensely. I will be heading to Universal Studios Florida at the end of the summer to check out the new expansion of Harry Potter world and I will most definitely be taking lots of pictures to share on here! 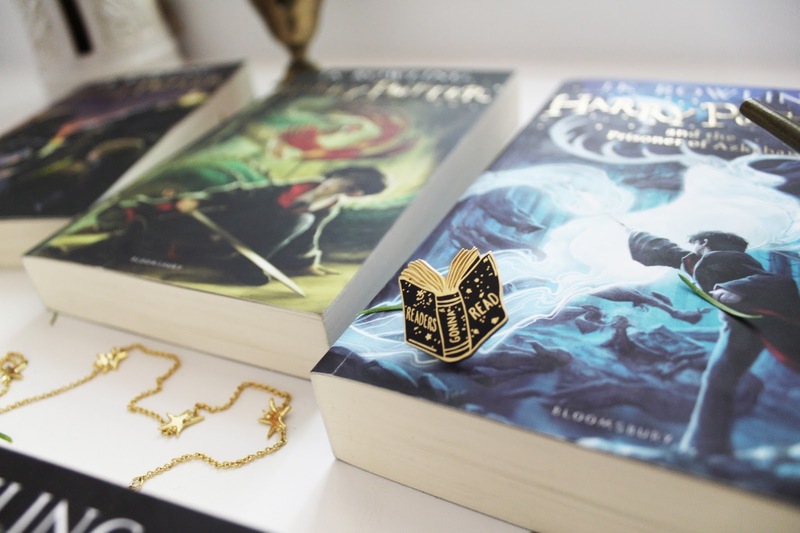 By the way the pictures featured above include the new Bloomsury covers of the series as well as my pin from Literary Emporium on Etsy, my Mr. Kate star necklace and wand from Universal Studios Orlando! These were super fun to set up and take.